Legends also speak of Tenkar's Traveling Tavern, a tiny wooden box carved with intricate dwarven runes, save for a single door wood burnt into one side of the fist-sized cube. Once per month, or on any dwarvish holiday, the owner can speak the command word and cast the cube onto the ground. It will grow into a sprawling tavern that is 30 feet wide, 50 feet long, and stand a full two stories. Inside, a combination of enchantments conjures forth a spectral dwarven innkeeper and trio of human servers. A spectral halfling also appears in one corner of the tavern interior and performs tunes both merry and calming. Tenkar's Traveling Tavern remains in this form for a full 12 hours, after which it returns to its original form of a wooden cube. Up to a dozen patrons may enter the tavern during this twelve hours where they will feast on the finest food, perfectly crafted ale, and find relaxing beds on the second floor. Such a wonderful celebration heals them of 1d6+1 hit points and provides +2 to all saving throws made to resist fear effects for twenty-four hours after leaving the tavern. If anyone fails to exit the tavern before its 12-hour enchantment ends, they awaken unharmed on the ground where the tavern once stood, but have a terrible hangover. They suffer a -1 penalty to all to-hit rolls and saving throws for the next twenty-four hours and spellcasters must make a saving throw (with a +4 bonus) whenever they attempt to cast a spell to concentrate through their pounding headache. In addition, the dejected individuals find that they no longer have Tenkar's Traveling Tavern in their possession. Instead, the enchanted box is transported within one mile of the nearest dwarf. 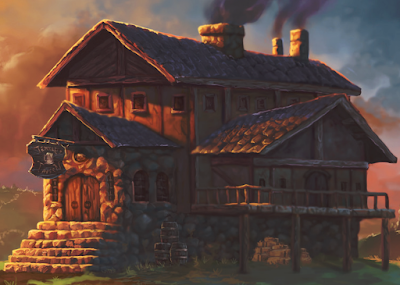 Only a single Tenkar's Traveling Tavern exists and it is regarded as a holy artifact to many dwarves. If discovered and returned to dwarven settlements, there will undoubtedly be great rewards. However, should non-dwarves discover Tenkar's Traveling Tavern and attempt to abuse its power they will draw the ire of any bearded folk who discover this transgression.